When reporting violent situations (mass violence, domestic violence, and suicide) stakeholders become particularly important. Being sensitive to the victims and their families, but still informing the public can be tricky. As a consumer of media and someone who has seen a lot of mass violence on the media in recent years (Las Vegas, Orlando, Barcelona, Paris, etc.) I recognize there are right and wrong ways to report violent situations. The public feels bombarded with tragedy and like all the media does is report negativity. Sometimes as a member of the community we feel as if all that is in the news anymore is tragedy. Violence hurts morale in not just the city directly affected, but the world. Reporters need to raise spirits in these bad times and keep people from having a negative world view. In this day and age, people say that every time they turn on the news something devastating has occurred in another city. We live in a negative era and journalists can use their power to be a positive, breath of fresh air for consumers. Reporters should use sensitivity when deciding on pictures and videos to use in the report. It is important not to post pictures of the perpetrator with weaponry or show explicit content including the victims. 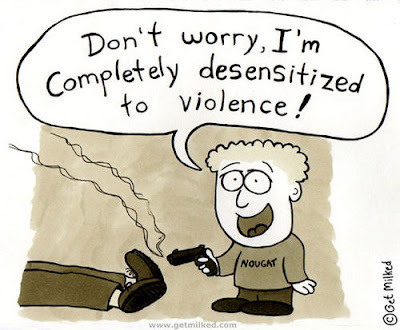 Also, it is important to explain that violence is rare and complex, and consult colleagues on how to properly discuss mental health and make the public understand that most mentally ill people are not violent. Mental illness should not be dubbed as "violent" and this should be explained. Reporters can diffuse the situation and try to take some of the poison out for the public. Reporters should focus on statements from witnesses and stories about the victims and their families that were obtained in an ethical manner. It is a news outlet's duty to consider how victims, their families, the community, the police, the shooter, and mental health issues are portrayed in a story. "Constant Exposure to Negative News"
In Huffington Post article "What Constant Exposure To Negative News is Doing to Our Mental Health" Carolyn Gregoire explains how violence in the news is "messing with our heads". Dr. Graham Davey suggests that exposure to violent news changes are mood immediately upon conception. Her studies prove long-term psychological issues are also linked to negative news, including developments of stress, anxiety, depression, and post-traumatic stress disorder (PTSD). Her studies show that negative news exposure isn't just harmful to consumers, but the journalists reporting it in the media as well. Although the media can't change that tragedy is happening, they can change how they report it. Consumers need hope and to realize that the violent situation that occurred is isolated. When the media does not assure them of this and report the news correctly people develop negative world views and live their lives in fear. Journalists need to report in helpful ways vs. harmful ways through consulting "Recommendations For Reporting on Mass Shootings" and surround negative news with positive news.